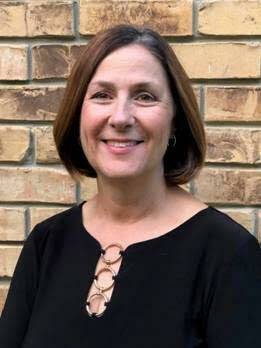 10:00 am-Hall of Honor Induction and Brunch, High School Cafetorium-Wendy Watson, Inductee. Rainwear has been added to the store! "If you are interested in purchasing a full-color yearbook ad for your business, please contact Mrs. Ali Tyner at tynerali@tenahaisd.com." Panola College will host the 6th Annual Veterans Day Dinner at 6:30 p.m. in the Frances B. Ross Ballroom at Panola College on November 8. This event is coordinated by two service organizations at Panola College: the Green Jackets, who serve the College and community as goodwill ambassadors, and the Student Government Association (SGA). The Green Jackets and SGA, along with area individuals, organizations and businesses are sponsoring the event. The event is free for any East Texas service member and one guest and will feature dinner, music, a guest speaker, and recognition of the oldest and youngest veterans in attendance. Individuals who wish to recognize a particular veteran, in honor or memorial, may donate $35 for a Flag of Honor by visiting https://form.jotform.com/PanolaMain/flag-of-honor. The 3x5-foot flag will be mounted on a 6 ft. pole and placed along Bird Drive and W. Panola Street from November 1 – 15. The flags will have signs attached with the veteran’s name, branch of service and personal message from the donor. The Green Jackets and SGA invite additional sponsors to help honor our service men and women with one of following sponsorship options: Hero Sponsorship - $1,500; Red Sponsorship - $1,000; White Sponsorship - $500; or Blue Sponsorship - $250. Signs and banners will recognize these sponsors and their names will be printed in the dinner program. 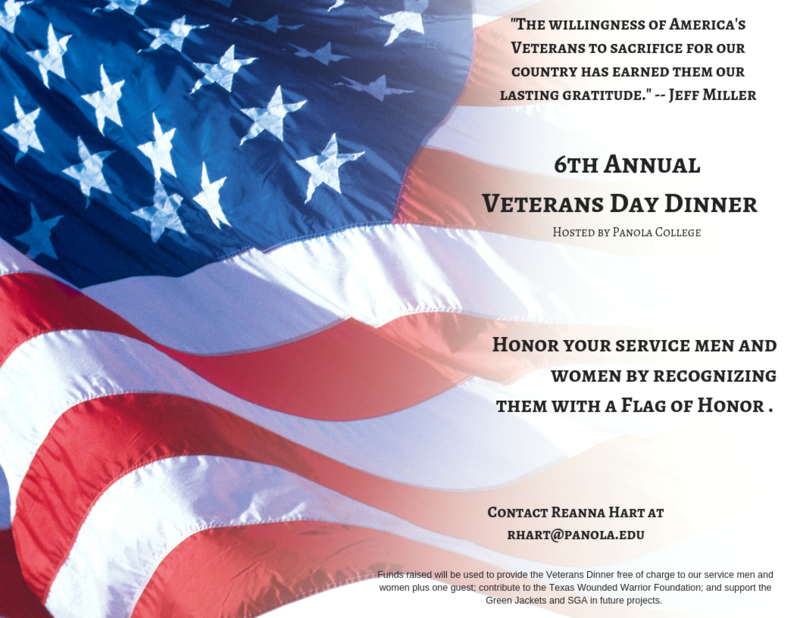 Veterans and their guests who wish to attend the Veterans Day Dinner must make reservations in advance. The reservation deadline is October 31. Contact Reanna Hart via e-mail at rhart@panola.edu or call 903-693-2094, or Brian Naples, e-mail at bnaples@panola.edu or call 903-693-2043. 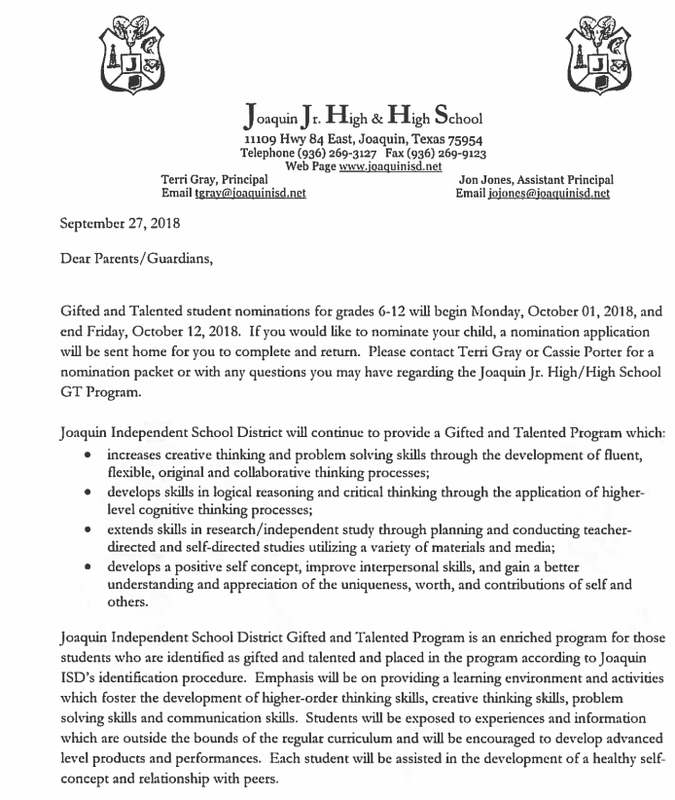 Center ISD will be taking nominations for the Gifted and Talented Program beginning October 1, 2018, thru November 16, 2018. If you would like to nominate a student for this program, contact the campus counselor for a nomination form. The information sessions will be held in the Health Careers II building, room 223.
information session is not necessary. Guest artists Miraslov Hristov and Chih-Long Hu will present a violin and piano recital at 7:30 p.m. Sunday, Oct. 7, in Cole Concert Hall at Stephen F. Austin State University. The Swingin’ Axes and Swingin’ Aces at Stephen F. Austin State University have “Something For Everyone” in store when the jazz bands perform at 7:30 p.m. Friday, Oct. 12, in W.M. Turner Auditorium on the SFA campus. Concert pianist Kevin Ayesh will perform at Stephen F. Austin State University at 7:30 p.m. Saturday, Oct. 13, in Cole Concert Hall as part of the SFA Friends of Music Concert Series. Ayesh will present a varied program featuring the music of Ludwig van Beethoven, Johannes Brahms, Gabriel Fauré and Frédéric Chopin. This week's San Augustine middle school and jv games have been moved to San Augustine. The game will start at 4:30PM on Thursday. Tenaha Cross Country - Zavalla Invitational for Wednesday Cancelled. Members of the Panola College Chorale performed with choirs from the Ark-La-Tex area and the Shreveport Symphony Orchestra on Sunday, Sept. 16, at First Baptist Church in Shreveport, La. 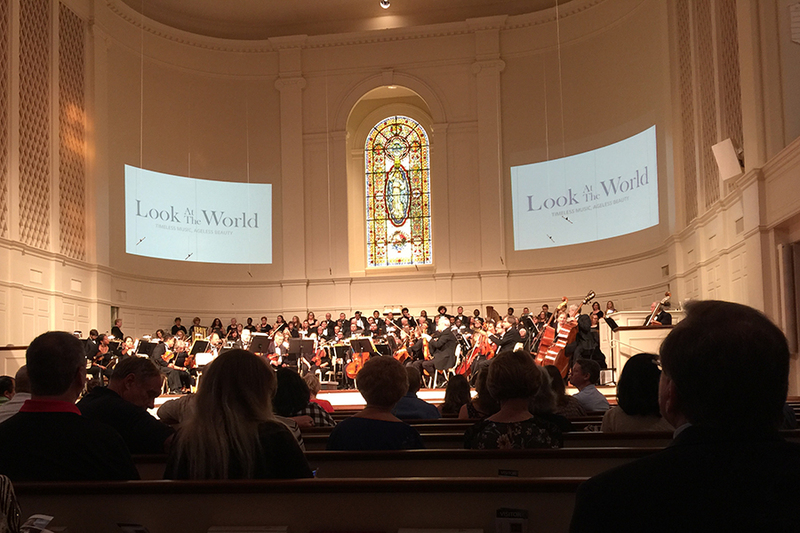 Presented by YouthCUE, “Look at the World: Timeless Music, Ageless Beauty” was an incredible two-hour musical extravaganza. The 225-voice mass choir consisted of singers from Panola College, East Texas Baptist University, Southern Arkansas University, San Antonio Youth Chorale, First Baptist Church and Broadmoor Presbyterian Church. The group was directed by YouthCUE founder, Randy Edwards. The program included a poem performed by Angelique Feaster Evans and several musical selections performed by soloist Jonathan Burton, as well as the Shreveport Symphony. The concert was an awareness-builder and fundraiser for Volunteers of America in North Louisiana. YouthCUE presented the VOA with a donation check for $10,000 and the performers also presented a check for $2,156.78. “The performance was inspiring and uplifting to the listening audience,” said Sandra Bauer, Panola College music professor and director of choral activities. Bauer is serving as president of the Texas Two-Year College Choral Directors Association this year. Panola College music students performing in the concert included Sydnee Taylor, Carthage; Dakota Brown, Marshall; Lucy Eke, Lagos, Nigeria; Hunter Moon, Beckville; Whitney Ramsey, Center; Maggie Sims, Center; Pamela Painter, Marshall; Loren Caserta, Beckville; Aaron Tello, Center; Emma Harden, Bullard; Afrikina Dotson, Center; Carrie Lilly, New Caney; Toluwani Ayodele, Lagos, Nigeria; Victor Chinaka, Lagos, Nigeria; Funminiyi Alabi, Loma Linda, California, and Kacia Johnson, Tatum. 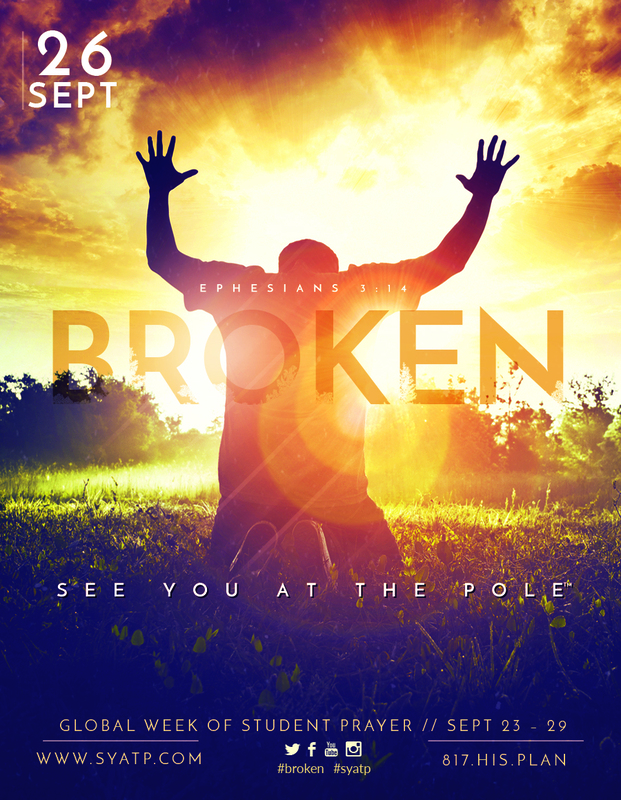 The annual student-led "See You at the Pole" event will be held on, Wednesday, September 26. The Joaquin Junior High football games vs Garrison scheduled this week on September 27th will be played at Logansport High School. The 7th-grade scrimmage will start at 6:30 PM followed by an 8th-grade game. The Junior High game scheduled for next week on October 4th will be one game @ Elysian Fields at 5:00 PM. Ms. Brooke Harrison has been teaching for five years in Shelbyville. Before she was Shelbyville’s Chemistry teacher, she was a forensic scientist for nine years. She wanted to teach at Shelbyville for the opportunity to make a difference in student’s lives and hopefully convince a few that Chemistry isn’t so terrible. She is currently the UIL Science team coach, a Sophomore Sponsor and is organizing a Chemistry Magic Show with some of our students. Her hobbies include travelling, listening to music and cooking. Her favorite sport is Aggie Football and her biggest role model is her great aunt. She says that the best part of working at Shelbyville is sharing and inspiring a curiosity about science and the world. She wants her students to be curious about the world around us and to never stop exploring and asking questions. Her life advice for her students is for them to travel and get out and see the world. She says it’s such a happy surprise to be teacher of the week. Special Thanks to Tony Willoughby and Center Welding for building and donating our new “Tiger Cage” for our district. Just hold the Ctrl down and click on the link. Shelbyville ISD see you at the pole on Wednesday, Sept. 26th, 2018 at 7:35 am Shelbyville High School flag pole. Panola College Volleyball improved to 15-4 overall after a two-stop trip to Dallas with a 4-set win over Brookhaven College (25-23, 22-25, 25-18, 25-22) and a sweep of North Lake College (25-19, 25-11, 25-16). Panola was led offensively against Brookhaven by Rebecca Rabius who tallied 13 kills, while Carol Santana and MiKayla Ware added 8 apiece. Molly Harris and Bri McGown dished out 22 and 19 assists, respectively. At the net, Thaynara Godoi, Alyssa Lozoya, and Sabrina de Lima picked up 2 block assists each. Hannah Ramirez racked up a season-high 27 digs with Ware adding 15 of her own. The Fillies then swept North Lake College with a balanced attack led again by Rabius with 10 kills, Riley Seegers added 8, and MiKayla Ware chipped in 7. Bri McGown and Molly Harris dished out 19 and 16 assists each, and the pair was 2 digs short of notching a double-double with 8 digs apiece. Seegers was also a force at the net assisting in 4 blocks, and Hannah Ramirez again led the floor with 15 digs. The Fillies will return to action October 3rd to begin round 2 of Region XIV-North play at Trinity Valley. (Daphinie Correa and Riley Seegers block against Polk State). The Shelbyville Band Booster Meeting scheduled for Monday, September 24th has been canceled. We will update when the meeting has been rescheduled. The Panola College Fillies had their chances Wednesday night in a key match-up with 6th-Ranked Navarro, but fell short in 4 sets (20-25, 25-20, 25-27, 25-10). Offensively, Thaynara Godoi led with 12 kills hitting a stellar .607, while Sabrina de Lima and Daphinie Correa followed with 9 each. Molly Harris dished out 23 assists and Bri McGown added 16. At the net, Alyssa Lozoya finished the night with 3 block assists and de Lima chipped in 2. Three Fillies finished with double-digit digs including Hannah Ramirez who led with 18, and Harris and Carol Santana who each added 12. "Navarro is a talented team playing with a ton of confidence right now, and we knew in order to win on the road in such a tough atmosphere we were going to need to play a complete match," said Head Coach Amber McCray. "We put ourselves in position to have a shot, but ultimately we did not execute when it mattered most." The Fillies will return to action this weekend as they travel to Brookhaven and Northlake College for matches at 11am and 4pm. (Hannah Ramirez passes a ball in serve receive). 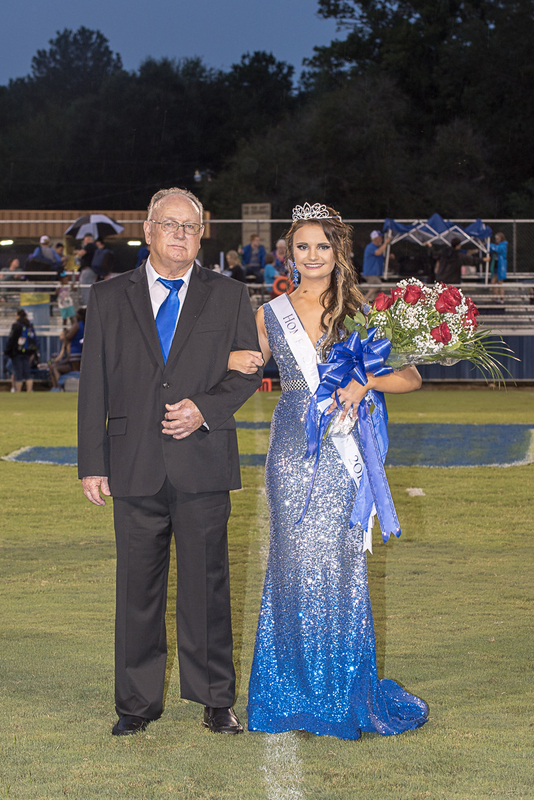 TLB Varsity volleyball vs. Shelbyville - Today – Here @ 4:00 p.m.
Tenaha Independent School District has named Roland and Dianne Cross as the 2018 Grand Marshal of the 65th annual Tenaha High School Homecoming Parade. Mr. Roland Cross, a 1956 graduate of Tenaha High School and Mrs. Dianne Cross, a she is a graduate of Plain Dealing, LA. , will have the honor of leading this year’s parade. Mr. and Mrs. Cross are lifelong members of the Tenaha community and have always played an active role in promoting the students of Tenaha ISD as well as promoting the success of the Tenaha community. Tenaha Independent School District is proud to have Mr. and Mrs. Cross as their 2018 Grand Marshal! This year’s homecoming theme is “The Power of Champions”, in recognition of the State Football Champions of 1998. The homecoming parade is set for Saturday, September 29th , at 11:30am. 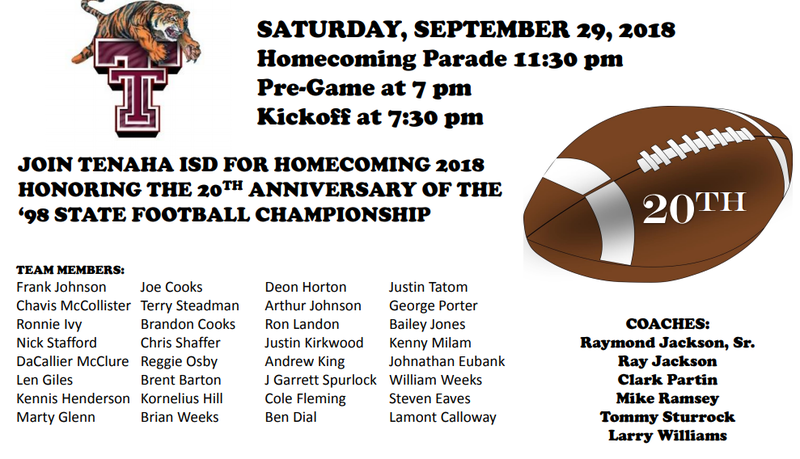 Other activities planned for homecoming day are the Hall of Honor Induction Ceremony at 10:00am in the Tenaha High School Cafetorium and the Senior Class will be hosting a fundraiser luncheon on the Tenaha Square at 11:00am. The pre-game activities will begin at 7:00pm. The Tigers will take on the Timpson Bears at 7:30pm. “Timpson has had a fantastic start to the school year. Our enrollment at the HS is 214 and our enrollment through Panola College is 158. We have started several new programs at the HS this year….T-Shirt Shop, Welding, Sports Officiating, Grow Your Own, Drama Club/Class, along with our STEM and College programs we added last year. Super proud of our staff members who are offering new opportunities to our students and our entire staff for providing our students a strong foundation as to fuel our kids’ success in these programs. Very blessed to be a BEAR!” –Stephanie Behrens, Dean of Collegiate Center/High School Principal. Timpson Lady Bear Volleyball is 21-4 for the season after defeating Union Grove in 3 sets on Tuesday night in Union Grove. Set scores: 25-16, 25-15, 25-11. TLB is 3-0 in district with wins over Carlisle, San Augustine, and Garrison. Each month teachers nominate students that exhibit outstanding qualities in and out of the classroom. 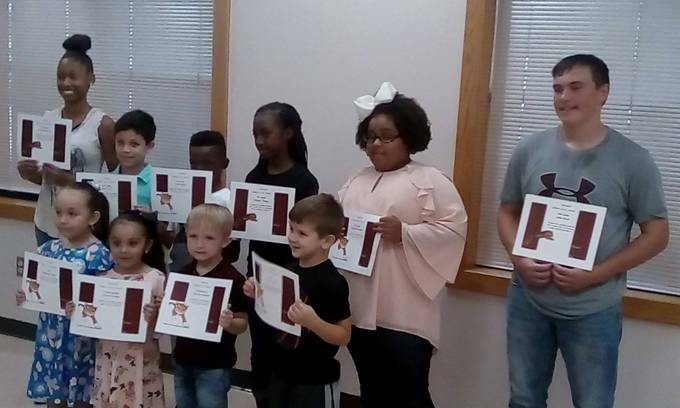 Students that are featured each month display leadership skills, inspires others to excel and are committed to promoting a positive attitude towards achieving their goals. The Shelbyville Band Boosters will be meeting at 7 PM on Monday, September 24th. The meeting will take place in the band hall. Everyone is invited to attend. We took the risk to switch from military style to corps style marching. We took the risk to produce a multi-sweepstakes award winning middle school band. This Friday, Tenaha Tigers vs San Augustine Wolves is our Gold Game to raise awareness of childhood cancer! Wear Gold! The Seniors are selling shirts at the game for 20.00! Half the profit goes to the ASCF. This organization provides housing while children are taking treatments with no cost to the families. So Don’t miss what is sure to be a great game!! Kickoff at 7:30!!! We are extremely excited about the opportunity we have to renew a great rivalry Friday night at Raymond Jackson Stadium. In order to ensure the best fan experience for everyone attending, we are asking that all TISD students remain in the stands during the game. We have blocked off a section on the North end of the stadium next to the band that we would love to see our students fill up and help the band cheer on the Tigers. But if students are not in that section, we will ask that they remain seated with their parents. It should be a great game between two great teams and schools. We hope to provide everyone with the safest and most enjoyable experience possible. See everyone Friday at the Pit. Timpson FFA is preparing for the East Texas State Fair starting on September 20th. There are about 28 students that will be showing animals and they plan to bring home many wins and even more memories. Timpson’s t-shirt shop has stayed busy since it’s opening in June. As of September, they have sold 425 shirts and have over 200 shirts in upcoming orders. They have made shirts for the Timpson volleyball and football teams as well as spirit shirts for the community and elementary, middle school and high school staff shirts. The Timpson Bear Band is up to 88 members and have seen a growth in playing potential and ability this year. They are looking forward to the UIL marching contest on October 20th and area contest on October 27th. Tenaha JH Scrimmage on Thursday 9-20-18 at San Augustine 4:30 pm; JH Game & JV Game will follow. 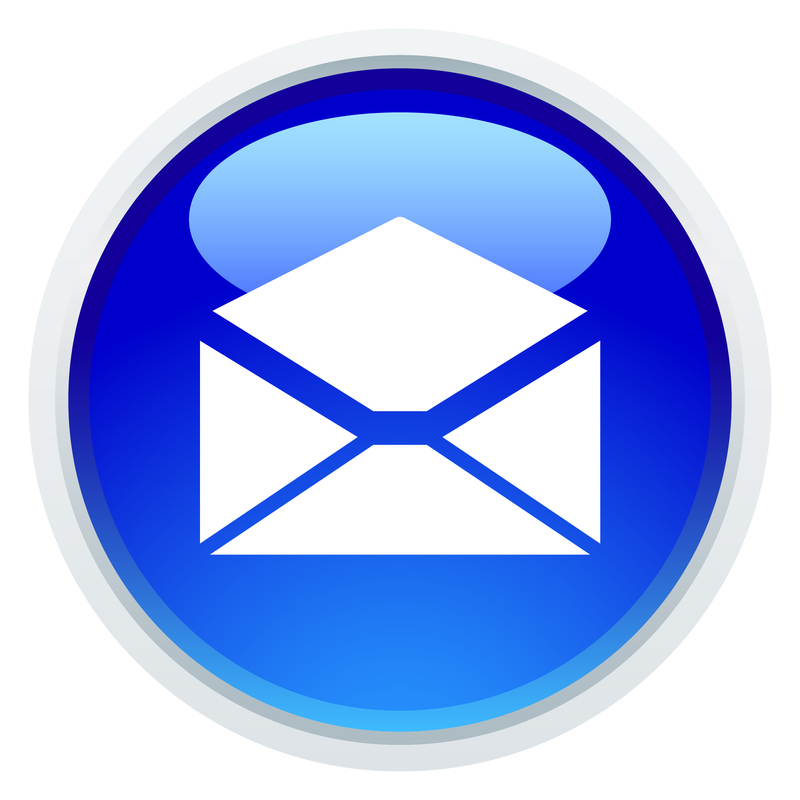 A Center School Board meeting will be held on September 20, at 12 noon. The Korean Pop Club has been added to the Homecoming line-up. They will be represented by sweetheart Miriam Almaguer and Beau Oscar Sanchez. Sweetheart and Beau pictures will be available after Homecoming. 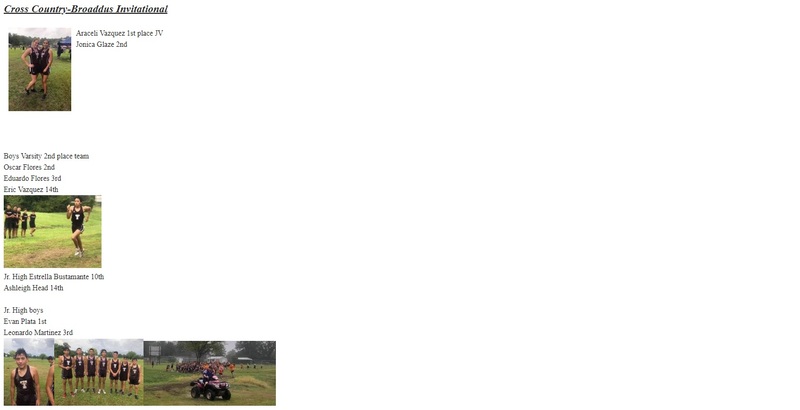 The Roughrider Cross Country team competed in the East Texas Invitational on September 15. The Varsity boys placed first as a team. Seven of the boys placed in the top 15, and Jacob Garcia finished 1st. Varsity girls placed 6th. JV boys placed 1st, CMS boys placed 3rd, and CMS girls had two medalists. Varsity boys (competing against 56 runners): Jacob Garcia (1st overall), Jesus Gonzalez, Alex Huerta, Jonathan Bustos, Edwin Morin, Adrian Huerta and Eliseo Delacruz. All seven placed in the top 15 runners. Varsity girls (competing against 69 runners): Jessica Alvaredo (5th overall). 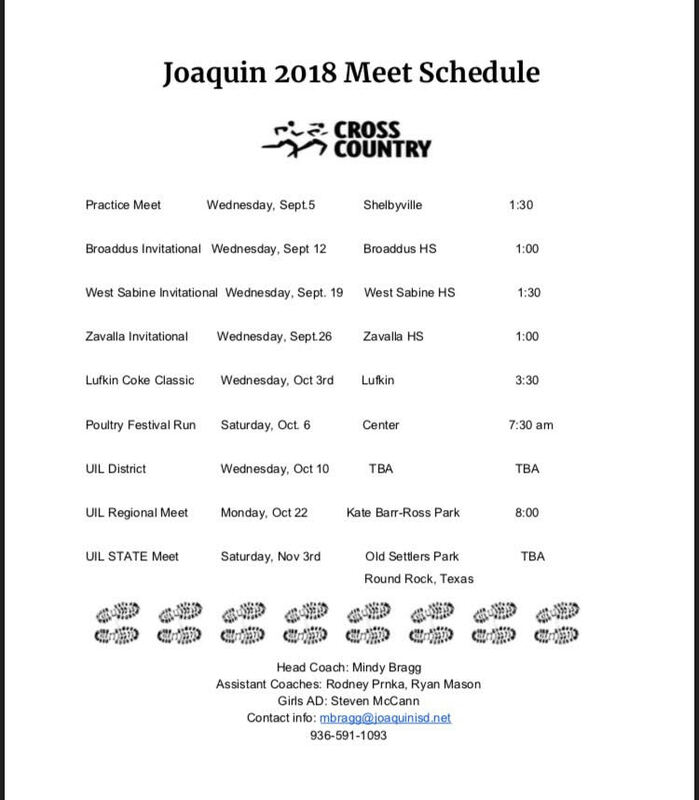 JV boys (competing against 56 runners): Ben Garcia (1st overall), Jesus Bustos, Jacobo Rafael, Leo Alvaredo, Osvaldo Guevara, Tyler Allen and John Hernandez. All seven placed in the top 17 runners. CMS girls (competing against 51 runners) who placed: 7th graders Jasmine Olivares ( 3rd overall) and Yuliana Garcia (7th overall). CMS boys (competing against 81 runners) who placed: Gonzalez (3rd overall), Caleb Garcia (6th overall), Jose Valdez,Omar Aviles and Peyton Montes. Dutchess and Queen Candidate pictures are here. Panola College Theatre Presents Hitchcock's "The 39 Steps"
Looking for a good play to watch? Love Alfred Hitchcock movies? Panola College’s theatre will present the hilarious stage adaptation of “The 39 Steps” as the dinner theatre performance Friday-Sunday, Sept. 22-24. Doors open for dinner theatre at 5:30 p.m. and the curtain will rise at 7 p.m. The play is produced by special permission from Samuel French, Inc.
Based on Alfred Hitchcock’s first big hit, “The 39 Steps,” the play is a Hitchcock masterpiece with a dash of Monty Python, to create a fast-paced whodunit for anyone who loves the magic of theatre. Richard Hanney, the disillusioned hero finds himself framed for murder and the target of a nationwide manhunt. In an effort to clear his name, and save the country, his journey takes him on a mad dash through Scotland and England as he tangles with police, killers, spies, chases, and, of course, beautiful women. Starring in Panola College’s production as Richard Hannye: Shelby Watson, Leon; Pamela: Jasmine Ryan, Martinsville; Annabella Schmidt: Sarah Owens, Mt. Enterprise; Mr. Memory/Crofter/Mr. McGarrigle: Justin Gonzales, Rains; Compere: Christian Kotara, Spurger; Heavy 1/Salesman 1/Policeman 1: Keath Kibbey, Huntington; Heavy 2/Salesman 2/Policeman 2: Peyton Proffet, Center; Milkman/Porter/Train Police/Paperboy/Radio Announcer: Yancy Flores, Shelbyville; Mrs. Higgins: Angel Kammer, Kennard; Mrs. Dunwoody: Bethany Grove, Kennard; Professor Jordan: Tailer Chong, Rains; Margaret: Hannah Williams, Gary; Mrs. Jordan/Mrs. McGarrigle: Abigail Parish, Chireno; Pilot 1/Sherriff/McQuarrie: Dustin Bennett, Tenaha; Pilot 2/Chief Inspector Albright: Cody Osburn, Center; The Scottish Band/Old Man: Freeman Thomas, Carthage. Heading up the crew is Assistant Director: Kyree Williams, Hillsboro; Stage Manager: Maelbi Caledron, Seagoville and Nathaniel Endsley, Huntington; Production Manager; Lighting Design: Kassandra Escobar, Centerville; Lighting Technician: Brenton Humphries, Gary; Costume Design: Laci Sepulvado, Mt. Enterprise; Assistant Costumers, Properties: Emily Robinson, Martinsville; Assistant Stage Manager: Maria Majai, Mt. Enterprise; Running Crew: Chailey Norton, Mt. Enterprise; Kassidy Weatherford, Gary; Catalin K, Mt.Enterprise. The dinner theatre production is the annual fundraiser for the Panola College Theatre Department. This year’s menu includes Italian lasagna, sautéed green beans, salad, bread, chocolate mousse, coffee, tea, and water. 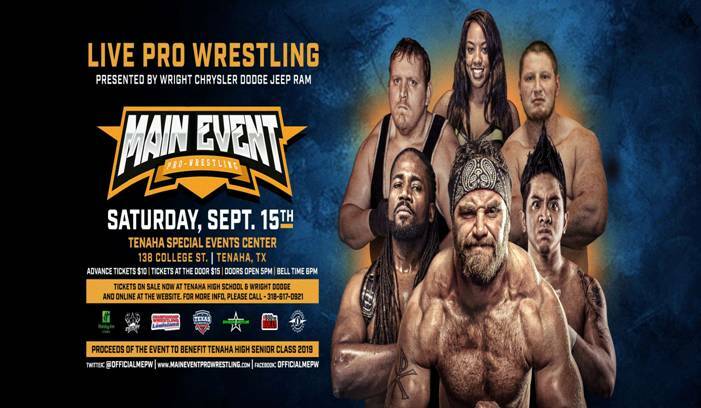 Ticket prices are $40 for adults, $35 for Panola College students, $25 for senior citizens, and $20 for children under 12. Tickets for Sunday dessert matinee are $20 for adults, $15 for Panola College students, $12 for senior citizens, and $10 for children under 12. The play is adapted by Patrick Barlow, from an original concept by Simon Corble & Nobby Dimon. The story is from the novel by John Buchan. The film was produced by Alfred Hitchcock. 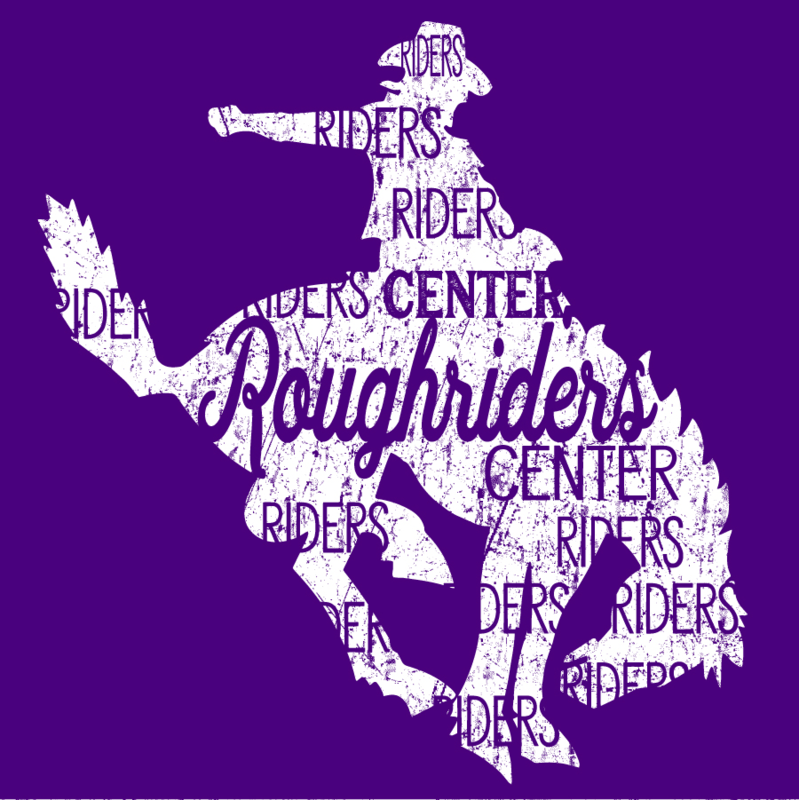 The Junior Class is selling Roughrider shirts to raise money for Prom. The Orchestra of the Pines at Stephen F. Austin State University will present its season-opening concert at 7:30 p.m. Monday, Oct. 1, in Cole Concert Hall on the SFA campus. Pierre-Alain Chevalier will debut as the orchestra’s new music director, and he has selected a program that features works by Richard Wagner, Edward Gregson , and Ludwig van Beethoven. Casey Stringer, one of last year’s winners in SFA School of Music’s concerto competition, will perform as tuba soloist on Gregson’s Concerto for tuba and orchestra. “Young Talent” is the program theme when guest artist Blake Birmingham performs a euphonium recital at 7:30 p.m. Monday, Oct. 8, in Cole Concert Hall on the campus of Stephen F. Austin State University. The Stephen F. Austin State University Wind Ensemble will perform its first concert of the semester when the student ensemble presents “The Music of Viet Cuong” at 7:30 p.m. Tuesday, Oct. 9, in W.M. Turner Auditorium on the SFA campus. Described as “alluring” and “wildly inventive” by The New York Times, composer Viet Cuong’s music has been performed on six continents by musicians and ensembles. Pink Out shirts are now available. Please return the attached form by 9.21. Pick up your shirt from CHS on 10.3. 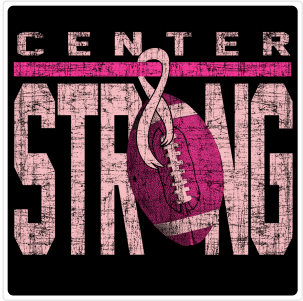 The CHS Varsity Football Pink Out Game is Oct. 5th against Brownsboro. Panola College traveled to Cedar Valley this weekend for a tri-match where they finished with a sweep of host Cedar Valley and a tough 5-set loss to Hill College. In their first match of the day, Panola defeated Cedar Valley (25-23, 25-17, 25-20). Offensively, the Fillies were led by Alyssa Lozoya with 11 kills and Sabrina de Lima with 10. Lozoya also assisted on 5 blocks and de Lima picked up 7 digs. Bri McGown and Molly Harris dished out 20 and 18 assists, respectively, and tallied 6 digs apiece. At the net, Thaynara Godoi led with 3 solo blocks and 6 assists, with Daphinie Correa adding 6 assists of her own. Hannah Ramirez led the floor defense with 20 digs. In their final match of the day, Region 5 powerhouse Hill College outlasted PC in a 5-set battle (25-20, 24-26, 25-23, 19-25, 12-15). Rebecca Rabius led the offense with 16 kills, followed by Daphinie Correa with 7. Bri McGown dished out 23 of the Fillies 33 assists. Thaynara Godoi assisted on 7 blocks and three Fillies registered double-digit digs. Ramirez led with 18, McKenzie Dimery picked up 11, and de Lima chipped in 10. Panola will resume conference play Wednesday when they travel to Navarro to take on the Lady Bulldogs at 7pm. (Alyssa Lozoya and Daphinie Correa block a TJC attacker). Anti-Bully Rally! Big Daddy Yum Yum and friends teach Tenaha students to say NO to bullying! Departure Time from CHS: 5:45 a.m.
On Saturday, Sept. 8, Panola College hosted 40 students and three directors from the band program at KIPP Generations Collegiate High School in Houston. Dwaine Hubbard, director of bands at Panola, talked to the students about the opportunities available through the band and choir programs. Reanna Hart, Panola College Student Success recruiter, explained the application process and guided the students on a tour of the campus. 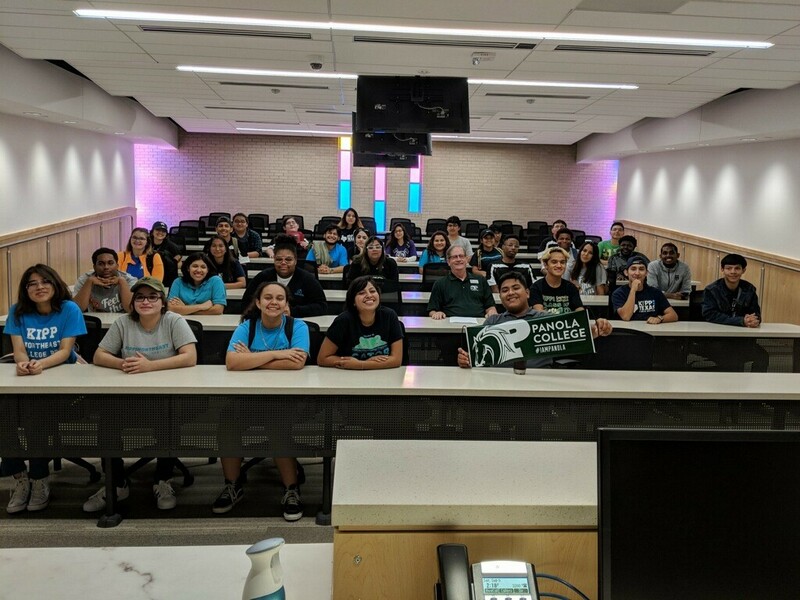 Panola College students assisting with the tour and visit included Dakota Brown, Marshall sophomore; Andres Leon, Center sophomore; Jose Torres, Center freshman; and Eder Nunez, Center freshman. Hubbard and KIPP band director Eric Sanford met at the Texas Music Educators Association convention in February and made preliminary plans for the visit. “I want to send a big ‘thank you’ to Eric. He is a former student of mine from Hallsville. We hope to see these students next year on the campus at Panola College,” Hubbard said. KIPP Generations Collegiate High School, founded in 2011, serves almost 600 college-bound Houston-area high school students. The student body is 92 percent Hispanic and 8 percent African-American. The school’s rigorous college-preparatory curriculum emphasizes reading, writing, and critical thinking. The school requires students to complete at least 400 hours of service learning activities as part of its focus on citizenship. KIPP Collegiate High School students toured Panola College on September 8. Playwright Don Nigro’s “Seascape with Sharks and Dancer” will open the fall semester of the Stephen F. Austin State University School of Theatre’s student-directed plays. “Seascape with Sharks and Dancer” is recommended for mature audiences. Tickets are $6. For tickets or more information, call the SFA Fine Arts Box Office at (936) 468-6407 or visit theatre.sfasu.edu. The Downstage Theatre is located in the Griffith Fine Arts Building, 2222 Alumni Drive. Christina Guenther and Ron Petti, faculty members in the Stephen F. Austin State University School of Music, will present the recital “Poems and Dragons” at 6 p.m. Tuesday, Oct. 2, in Cole Concert Hall on the SFA campus as a feature of the SFA Friends of Music Concert Series. Guenther, professor of flute, and Petti, professor and director of accompanying at SFA, will present a program of music by Charles Griffes, Jennifer Higdon, Eric Ewazen and Howard Buss. – all American composers. A play that speaks to working class Americans with real-life issues opens the Stephen F. Austin State University School of Theatre’s Mainstage Series this fall. Lynn Nottage’s “Sweat” won the 2017 Pulitzer Prize for Drama. The play opens at 7:30 p.m. Tuesday, Oct. 2, for a five-night run in W.M. Turner Auditorium in what will be the play’s Texas premiere. It is recommended for mature audiences. Single tickets are $15 for adults, $10 for seniors and $7.50 for students/youth. For tickets or more information, call the SFA Fine Arts Box Office at (936) 468-6407 or visit www.theatre.sfasu.edu. The Percussion Ensemble at Stephen F. Austin State University will present its first concert of the fall semester at 7:30 p.m. Wednesday, Oct. 3, in Cole Concert Hall on the SFA campus. The diverse program includes works by Dr. Brad Meyer, director of the SFA percussion studio and of the Percussion Ensemble, Steve Reich, Jacob Druckman, Nick Werth, Joe Moore, Eric Sammut and Joseph Aiello. The Stephen F. Austin State University School of Art and the Friends of the Visual Arts will present a free, one-night screening of the documentary “Cuba and the Cameraman” at 7 p.m. Friday, Oct. 5, in The Cole Art Center @ The Old Opera House in downtown Nacogdoches. The film, written and directed by Emmy-winning filmmaker Joe Alpert, depicts life in Cuba through Alpert’s lens for three struggling families over the course of 45 years. The College of Fine Arts at Stephen F. Austin State University will present its first Encore Event performance of the 2018-19 year with “An Evening with Branford Marsalis” at 7:30 p.m. Wednesday, Oct. 10, in W.M. Turner Auditorium on the SFA campus. Encore Event tickets are $45 for Section A seating; $36 for Section B seating; and $27 for Section C seating. Discounts are available for seniors, students, children and SFA faculty and staff members. This performance by renowned Grammy Award?winning saxophonist and Tony Award nominee Branford Marsalis is sponsored in part by Elliott Electric Supply. The Children’s Performing Arts Series at Stephen F. Austin State University will open its 2018-19 season with two performances of “The Legend of Sleepy Hollow” on Wednesday, Oct. 17. Join Ichabod Crane, Brom Bones, the lovely Katrina Van Tassel, the residents of Tarry Town and, of course, the Headless Horseman, as they live the story made famous by the legend. This version by Virginia Repertory Theatre is not too scary for children and targets students in kindergarten through fifth grade. Performances are at 9:30 a.m. and 12:30 p.m. in W.M. Turner Auditorium on the SFA campus. Tickets are $7.50 for individuals and $6 per person for groups of 20 or more. 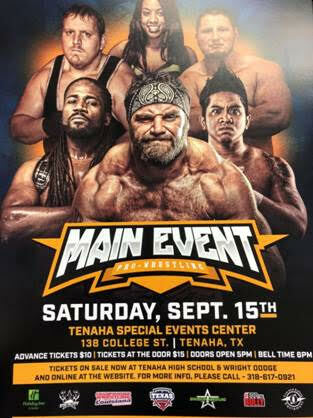 To order tickets, call (936) 468-6407 or (888) 240-ARTS. Visit the CPAS website at www.cpas.sfasu.edu for additional information. The College of Fine Arts at Stephen F. Austin State University will present the contemporary string ensemble SYBARITE5 at 7:30 p.m. Thursday, Oct. 18, in W.M. Turner Auditorium on the SFA campus. With knockout engagements around the country, SYBARITE5 has wowed audiences at venues including Carnegie Hall and Lincoln Center. This performance is sponsored in part Cataract, Glaucoma, Cornea & Retina Consultants of East Texas/Benchmark Optical/Medical Arts Surgery Center. Single event ticket prices for the University Series are $25 for adults, $20 for seniors, $12.50 for SFA faculty and staff and $10 for non-SFA students/youth. For more information, visit finearts.sfasu.edu, stop by the Box Office in Room 211 of the Griffith Fine Arts Building, or call (936) 468-6407 or (888) 240-ARTS. Joaquin High School/HS Site Base Committee Meetings will be held on September 24th, 5 p.m. in the auditorium. 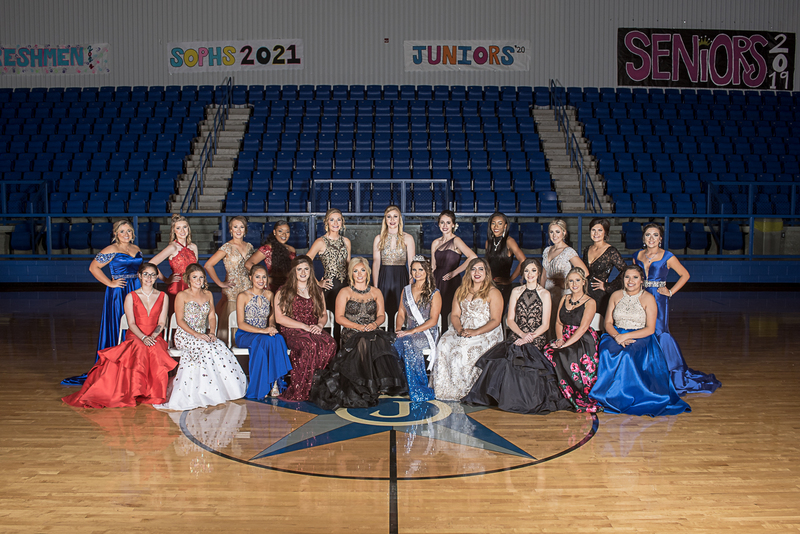 The 2018 Homecoming Court for Tenaha High School pictured below are (from left to right) Christasha Suell, BETA Sweetheart, Amya Giles, Athletic Sweetheart, Sarai Valencia, Band Sweetheart, Gracie Martinson, Junior Duchess, Giselle Rico, Senior Duchess, Iyterrica Giles, Freshman Duchess, Marneisha Rasberry, Sophomore Duchess, Anna Holland, FFA Sweetheart and Guadelupe Sandaval, JCC Sweetheart. 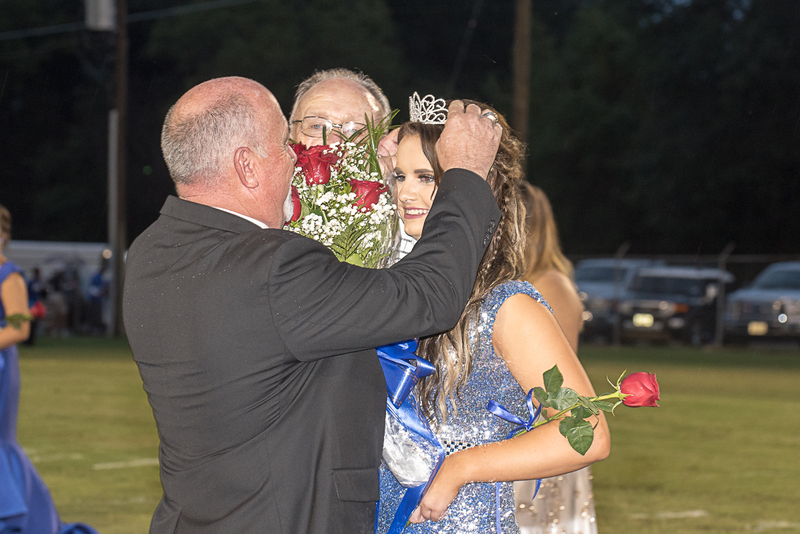 The 2018 Homecoming Queen will be named during the Homecoming pre-game ceremonies set to take place at 7pm on September 29th. 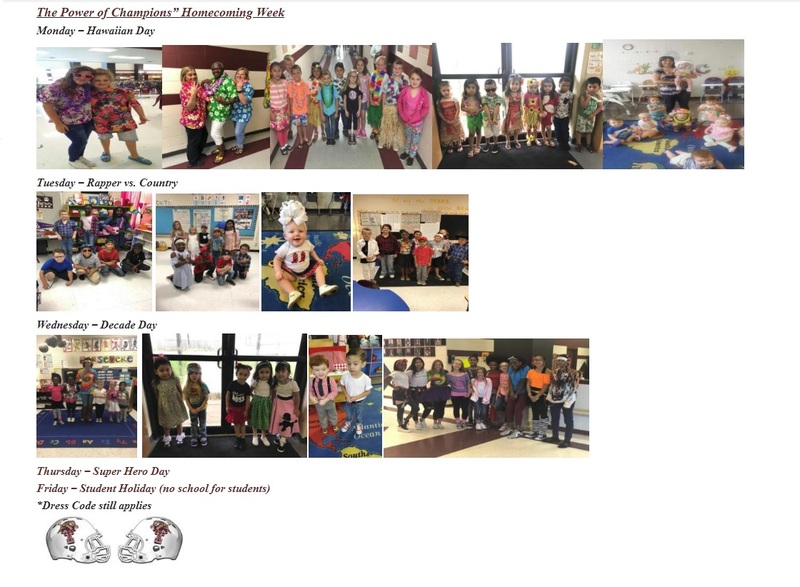 This year’s Homecoming theme is The Power of Champions. Special recognition will be given to the 1998 State Championship football team. 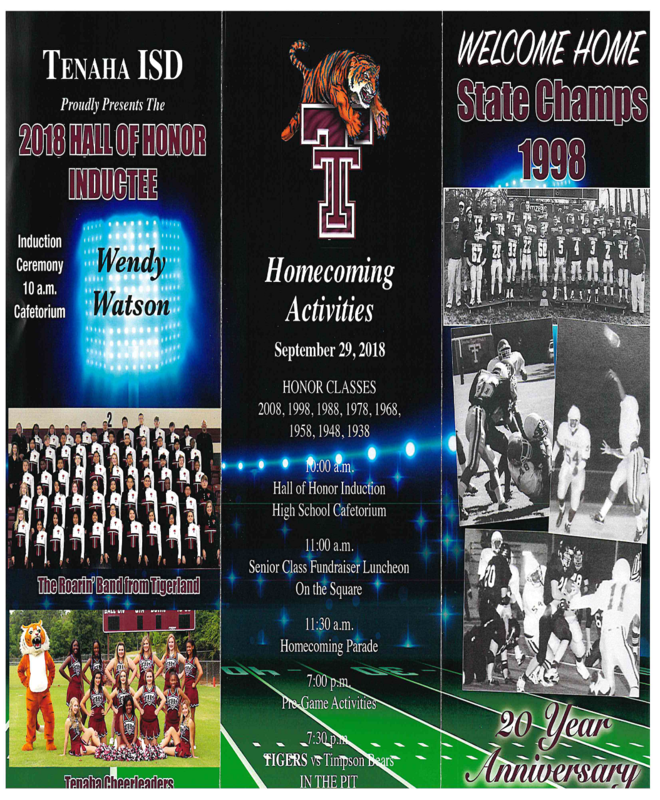 Homecoming activities planned for September 29th are Hall of Honor Induction Ceremony to take place at 10am in the Tenaha High School Cafetorium. The Senior Class Fundraiser Luncheon begins at 11am on the Square. The Homecoming Parade will begin at 11:30am on the Tenaha Square. Homecoming pre-game is set for 7pm and the kick off between the Tenaha Tigers and the Timpson Bears will be at 7:30pm in The Pit. 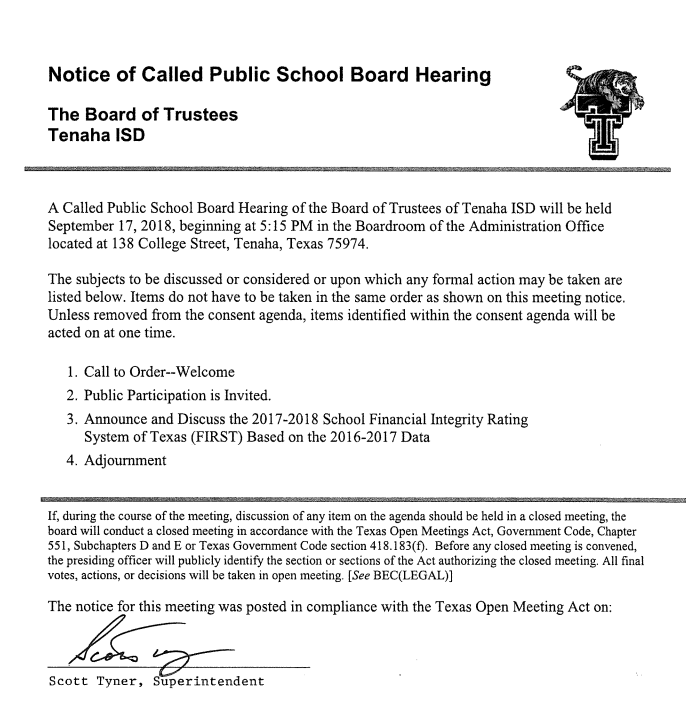 A time-honored tradition continues at Tenaha Independent School District. Tenaha ISD recognizes those that have displayed outstanding dedication and commitment to their community. Through the years numerous members have been initiated into the Hall of Honor. The process begins with nominations from members of the community. A committee then begins the difficult task of deciding who will be chosen. This year Tenaha ISD is proud to present Wendy Watson as the 2018 Hall of Honor inductee. Mrs. Watson has earned many distinguished awards throughout her teaching career. Some of these include being named Elementary Teacher of the Year, two of her years teaching. She has received the Superintendent Star Award, and most recently, the Tom Jones “Loyalty” Award. Mrs. Watson is married to John Watson. Together they have made Tenaha their home for the past 37 years. They have two children, Johnathan and Jim Anna, along with her husband George Britton. She and her family are active members of Old Home Missionary Baptist Church. Mrs. Watson is also a long standing member and current President of the Delta Kappa Gamma Society International. Mrs. Wendy Watson proudly joins the Hall of Honor, a select group of individuals that have left a lasting impact on Tenaha ISD and community. Library Book Fair – The Elementary Library is having a book fair this week! There are several book selections to choose from to purchase. 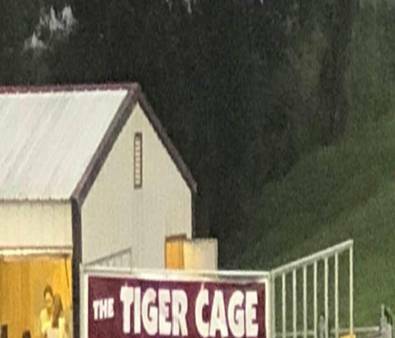 The Shelbyville Jr High game vs Joaquin will be in Shelbyville on Thursday, Sept. 13 @ 5:00 p.m.
Last Day to Order: Tenaha ISD Band annual Fan Cloth Fundraiser! See a band student or you can order at shop.fancloth.com/75974/399492. 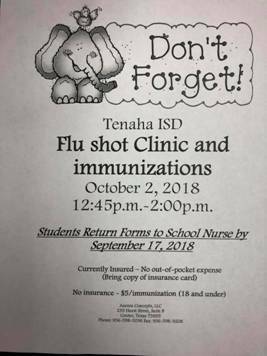 Please be sure to give a Tenaha band student credit so they can receive certain prizes! Welcome back to the 2018-2019 school year. I would like to take this opportunity to remind you about class dues. Each class has an activity account that is used for the purpose of paying for the prom their junior year. Each student is responsible for paying $40 in class dues EVERY YEAR. If a student has not paid their class dues they will not be allowed to attend the prom. The dues may be paid all at once or in installments. Please turn in dues to Mrs. Stella Baker. If you have questions about previous year’s dues contact Mrs. Stella Baker also. Her phone number is 936-248-5000 ext 401. Thank you, I hope we continue to have an amazing school year. With two tough losses to ranked opponents, the Panola College Fillies move to 11-2 on the season. The 6thranked Fillies opened up Region XIV North play with a loss to #9 Trinity Valley (25-22, 25-18, 25-22). Offensively, Daphinie Correa led with 7 kills while Thaynara Godoi and Sabrina de Lima added 6 apiece. Molly Harris and Bri McGown combined for 28 assists (15) and (13) respectively. De Lima led the team in digs with 10 and Hannah Ramirez added 10. 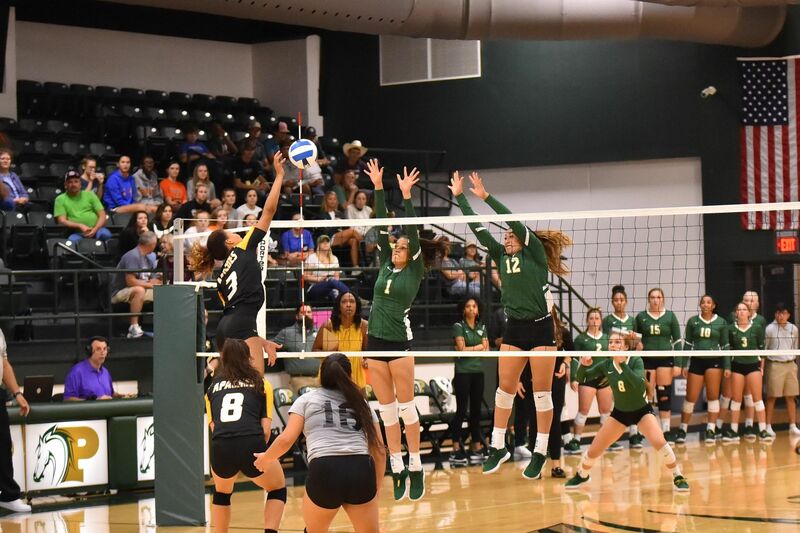 Panola opened play Saturday only of the Lee College Invitational taking on Florida powerhouse Polk State and fell in 4 sets (25-17, 25-13, 31-29, 25-20). The Fillies were led by freshman Mikayla Ware with 13 kills and 16 digs. Sabrina de Lima and Alyssa Lozoya added 8 kills each and Lozoya also added 4 block assists. Molly Harris led with 19 assists and 8 digs while Bri McGown added 16 assists with 12 digs. At the net, Daphinie Correa was a dominate force racking up 6 block assists and 2 solos, with Riley Seegers adding 4 assists of her own. Hannah Floyd anchored the floor picking up a season-high 32 digs in her debut at libero, a performance that helped solidify her spot on the All-Tournament team. In their final match of the week, PC swept Region XIV south opponent Coastal Bend, 25-18, 25-14, 25-12. Alyssa Lozoya led the Fillies with 9 kills on 13 swings, Daphinie Correa added 8, and Sabrina de Lima picked up 6. Molly Harris dished out 17 assists and Hannah Floyd notched 13 digs in the win. Panola College will return to action Wednesday as they take on #3 Tyler Junior College in Arthur Johnson Gym at 7pm. Tenaha ISD Band annual Fan Cloth Fundraiser! 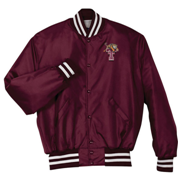 Tenaha ISD Sportswear Store in online! Thurs. Sept. 6 – Bear JV Football vs. Alto – Here @ 6:00 p.m.
Fri. Sept. 7 - Lady Bear Varsity Volleyball vs. Carlisle - There @ 4:30 p.m.
------------- Bear Varsity Football vs. Alto – There @ 7:30 p.m. Attention Class of 2021 Parents! - Mrs. Danielle Smith reports that class dues are $25.00 and need to be paid a.s.a.p. If your child did not pay for their freshman year, they need to pay that balance of $25.00 also. Yearbooks – Mrs. Danielle Smith reports that 2017-18 yearbooks are in! If you have a reserved copy, stop by the high school to pick it up. There are a few extras for sale for $50.00 each on a first come, first served basis. We would like to invite grandparents to come and eat breakfast with their grandchildren on Tuesday, September 11, 2018, in the cafeteria 7:15 - 7:45. A regular meeting of the Board of Trustees of the Shelbyville Independent School District will be held on Monday, September 10, 2018, beginning at 12:00 noon, in the Board Room of the Shelbyville Independent School District at 5322 St. Hwy. 87 S, Shelbyville, Texas. Volleyball t-shirt available for $17 click here for the order form. JV football game vs Sabine will be at 5:00 pm in Sabine on September 6th,2018. There will be NO Jr High game this week. The Panola College Fillies picked up four more wins at the Kruse Kickoff Klassic hosted by Blinn College over the weekend, improving the team’s overall record to 10-0. The Fillies opened the tournament overcoming a slow start to defeat Brookhaven College (25-20, 16-25, 25-19, 28-26) before sweeping Illinois Central (25-12, 25-20, 25-17), Victoria College (25-17, 25-9, 25-10), and Temple College (25-12, 25-18, 25-10). Three Fillies registered double-digit kills against Brookhaven, including both Daphinie Correa and Sabrina de Lima leading with 12 followed by Mikayla Ware with 10. Molly Harris dished out 24 assists and Bri McGown recorded 21, while Harris also contributed 2 aces and 9 digs and McGown added 6 digs of her own. Defensively, Hannah Ramirez notched a season-high 20 digs and de Lima added 13. In their second match of the day against Illinois Central, Panola was led by Alyssa Lozoya with 10 kills on a blistering .648 hitting percentage, Rebecca Rabius followed with 8 kills, and Mikayla Ware added 6 kills with 2 aces. Harris and McGown combined for 40 assists, Ramirez picked up 7 digs along with 3 aces, and McKenzie Dimery added 6 digs to close out the leaders for the match. In the victory against Victoria College, Correa and Ware lead the offense with 6 kills apiece, Lozoya added 5, and Rabius chipped in 4 of her own. Harris notched her second double-double of the year with 20 assists, 14 digs and 3 aces, while Chelsea Chadwick added 10 digs. Correa dominated the net with 3 solo blocks and 2 assists, Thaynara Godoi and McKenzie Dimery added 3 block assists each, and Riley Seegers and Lozoya picked up 2 assists apiece. The Fillies completed their weekend with a sweep of Temple College that featured Rabius leading with 10 kills, while Correa and de Lima added 8 apiece. De Lima also served up 4 aces, and Bri McGown dished out 20 assists in the win. Ramirez anchored the floor with 10 digs and Ware added 8. At the net, Godoi and Rabius each picked up 2 block assists. Panola returns to action Wednesday, September 5th when they open Region XIV-North conference play against Trinity Valley at 7 pm in Arthur Johnson Gym.